Basically, the idea is to share our thoughts on how we get our 'Irish' on in 333 words or less. The man who was to become St. Patrick was kidnapped, at the age of sixteen, by Irish raiders and brought to Ireland to serve as a slave. He was told by God, in a dream, to flee to the coast where he found a ship that took him back to Britain. According to legend, St. Patrick drove all the snakes from Ireland and to the sea. It's generally agreed upon, though, that its' a metaphor for his good works. Snakes being the common symbol for paganism (and not found in Ireland), it represents St. Patrick driving paganism from the country. While it's generally believed that the shamrock was what St. Patrick used to explain the Holy Trinity, others believe that the three pronged leaf was worn as a symbol of the cross. The Druids believed that four leafed clovers aided in spotting witches and demons, hence they were 'good luck charms'. Usually the clover leaf is only split into three parts, but some botanists believe that if a young clover leaf is damaged or exposed to certain chemicals, it takes on a fourth segment and becomes a 'four leafed clover'. It's said that snakes avoid shamrocks and that the plant is also a remedy for snake and scorpion bites. Some say that for good luck you should kiss the Blarney Stone, which is set into one of the walls of Blarney Castle. Legend has it that a witch cast a spell on the stone to reward the king for saving her from drowning. The spell gave the king the ability to speak 'persuasively eloquent' after kissing the stone. Legend has it that if you catch a leprechaun, you can make him tell you where his gold is hidden IF you don't look away from him. If you do...and they'll always try to trick you into doing so...he'll disappear, taking his gold with him. So, how about you? Any plans for St. Patrick's Day? A big 'thank you' to Mark Koopmans for hosting this hop and I'm glad I had a chance to participate in it this go 'round. You've probably already heard that on July 1st, Google Reader will be no more. Google is citing that declining usage as well as their need to focus on other products as the reasoning behind this. While you can download your Reader data via Google Takeout during the three month 'sunset period' they're giving us, you'll still have to find an alternative. While the site Lifehacker had some alternatives, I'm still not sure which might be the best route to go. Needless to say, I don't think the blogging community is going to be too happy with this turn of events. Any ideas on what might be a viable alternative? So if you don't like snakes, plant clovers. I think I'm going to sample Feedly this weekend. Several people are already using it and you can import your Google Reader in one step. Thanks for all the Irish trivia! That was fun! As for Google Reader...I'll be reading lots of blogs like yours to see what I should do...hrmph! I wonder if that's true about clovers being a cure for snake and scorpion bites. Probably not. Interesting info about St. Patrick's Day! Oh no, another blogfest! :) Still, top of the morning to you and Mark (O) Koopmans. Of course, living in England, we reckon St. George's Day should get more recognition. After all, the dude sleighed a dragon! I don't need Google Reader, I have plenty of feeds, including yours, up on my Blog List. Enjoy the weekend. I'm going now. @Gary: Yeah, I think St. George definitely had a rougher time of it than St. Patrick, though Paddy is the one who always gets the most press! What you should do is, when your neighbor gets good and drunk, dress Penny up as a leprechaun and send her over. Muahaha! :) Have a good one! I'm bummed about Reader. Luckily, our fearless leader, Alex is investigating. Great post, though. I love trivia and finding out cool things. Yes, let's all wait for you to do the research and then tell us which way to go to replace the Google Reader I never used. It anything goes wrong, we'll know who to blame, hahahaha! Great post and I even learned something!! As for google reader- I spent some time setting up folders, organizing and etc. and still found myself using only my blog roll in blogger...so I don't know that I will go with an alternative. I will investigate, though... see if anything stands out. @Melissa B: Thanks, me too...I used to be a whiz at Trivial Pursuit! Great trivia! I always love those little tidbits! And if you figure out an alternative to google reader, let me know. I'm flummoxed on what to do! Awesome facts, Thanks for sharing. Sometime I think I won't miss Google REader; all those unread posts are intimidating. Some great info you brought us about this green day fun. And it's always useful to get some snake facts. Great St. Patrick's Day trivia! Now I'm going to quiz my kids to see if they know what they're so enthusiastically celebrating! 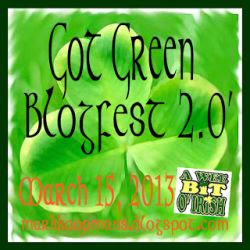 Thanks for the trivia Mark M. I'm learning all sort of things about St. Paddy's day on this blogfest. Sorry about Google Reader. Got to love legends. Things never happen how we think they might. The trivia was great and I learned something! :D I'm not sure what to do about the google reader thing either, haven't seen a good alternative yet, maybe feedly, need to look into it. Thanks for the trivia. Luckily, St. Patrick used the clover and not the poison ivy leaf to explain the Trinity!!!! Poor druids. No one has a day for them. Seems kinda unfair, huh? @Heather: Thank you and I always enjoy those little bits of trivia, as well. @Elise: I've been fiddling around with Feedly, a bit, and found that it's not so bad. There are a few features about it that I like over Reader...so, we'll see. @Mel: LOL....I know what you mean. As I mentioned, I've been fiddling around with Feedly and might look at a few other things. I'm sure we'll all find something that works, though. This community is great like that! I like that the Irish blessing grants that you live as long as you want. That's a good way to put it. Thanks for the random facts. I didn't know he was kidnapped. Well, I didn't know a lot of these things, but that one stuck out. I didn't know that about Google Reader. Bummer. And thanks for that Irish blessing. I receive that!